WHAT: The music program at the University of Illinois Springfield presents its Fall Showcase Concert entitled “Blow the Candles Out…”. Community members, students, faculty, and staff are invited to enjoy an evening of music filled with love, tragedy, comedy and enchantment. WHEN: Friday, November 30, 2012 at 7:30 p.m. DETAILS: The event will feature music highlighting a range of passions from the human experience. Highlights include an Indonesian lullaby, a traditional Greek piece, Themes from Romeo and Juliet, an enchanting new work by Phillipe Sparke, and arrangements of Sleigh Ride and Frosty the Snowman to indulge the holiday spirit. Studio Theatre doors open at 7 p.m. and the evening music begins at 7:30. The performance is free and open to the public. Refreshments will be served afterwards. The Chorus, under the direction of Dr. Sharon Graf, will open the Showcase with a traditional sea shanty arranged by Gregg Smith: “Blow the Candles Out”. Directed by Dr. Yona Stamatis, the Chamber Orchestra will perform selections including “Butterfly Lovers Violin Concerto” by He Zhanhao & Chen Gang and “Themes from Romeo and Juliet” by Tchaikovsky. Finally, Dr. Abigail Walsh will lead the Band through selections including David Maslanka’s “Rollo Takes a Walk,” and Samuel Hazo’s "Enchanted Spaces". Donations are welcome and will be used to benefit the UIS Music Student Merit Award. This year’s awards will be presented at the Fall Showcase. 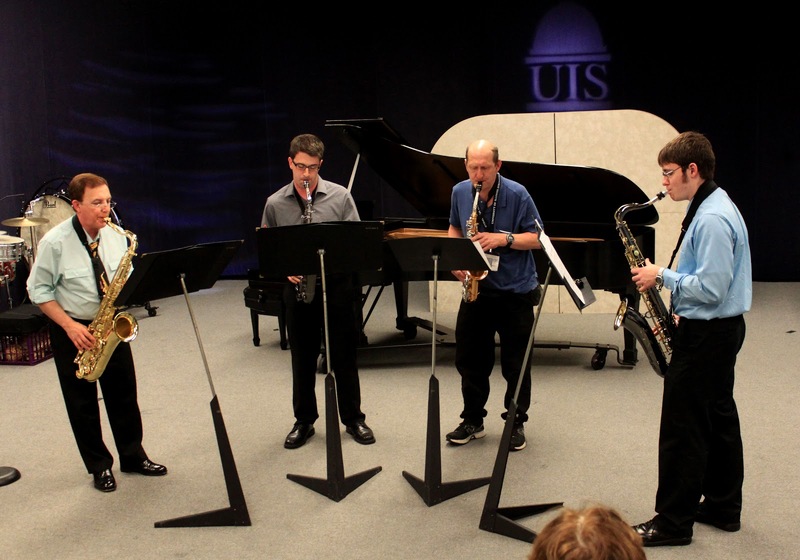 The UIS Music program began in 2001 and is comprised of students, faculty, staff and alumni, as well as Springfield community members, all with a variety of skill levels. Anyone who is interested in joining the UIS Chorus, Band or Chamber Orchestra may contact Dr. Abigail Walsh by emailing music@uis.edu or calling 217/206-7549.